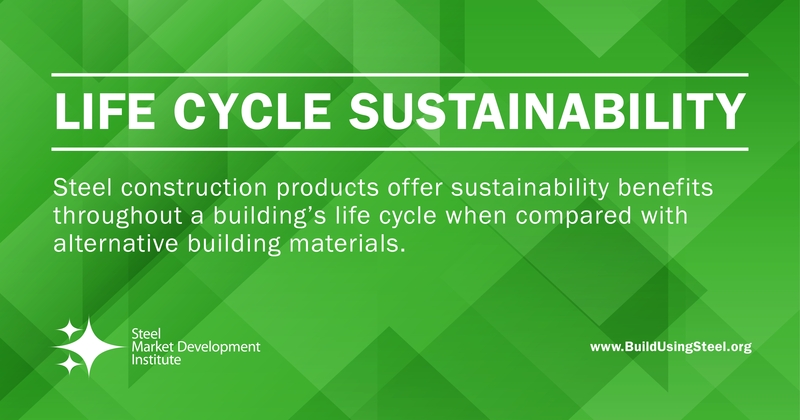 From production to end-of-life, steel construction products offer builders sustainability advantages over alternative materials like wood. A new document from the Steel Market Development Institute has been developed to examine the environmental impacts at each stage in the life cycle of wood building products. 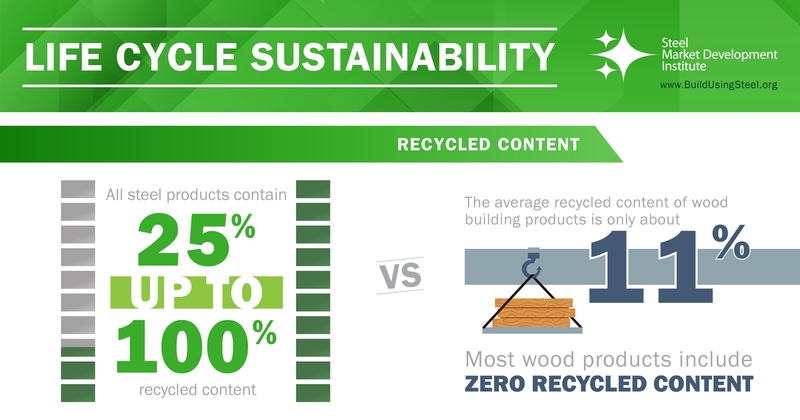 While all steel products have significant recycled content, ranging from approximately 25 percent to 100 percent, the average recycled content of wood building products is roughly 11 percent, and most wood products include zero recycled content. Instead, wood is often down-cycled into products like paper and mulch with short lifespans or is burned as fuel. In terms of construction waste, steel construction products are manufactured to specific dimensions resulting in little or no construction waste. In the wood industry, most sawmills convert less than 50 percent of the volume of logs into useful lumber. 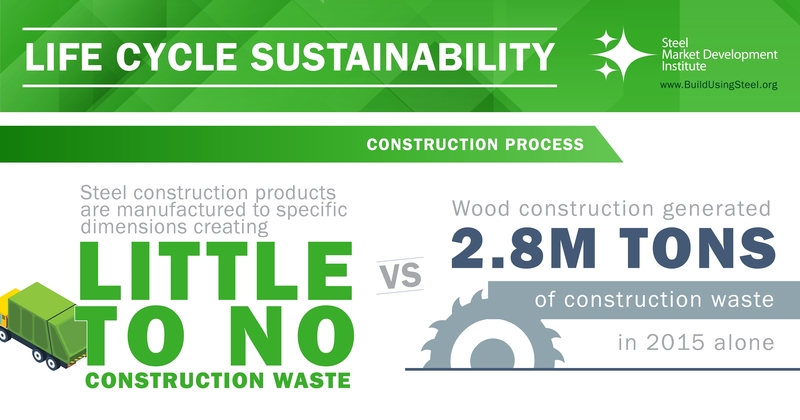 During the construction process, up to 5 percent of wood construction material may be lost, which resulted in 2.8 million tons of construction waste in 2015. At end-of-life, steel is the most recyclable and recycled material, with an overall recycling rate of 76 percent, and reaching 98 percent recycling in product categories like structural steel. 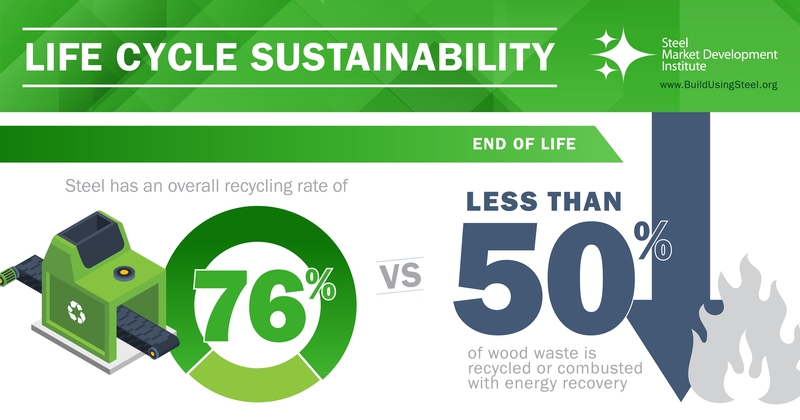 On the other hand, less than 50 percent of wood demolition is recycled or combusted with energy recovery. Wood construction waste, totalling nearly 40 million tons in 2015, either ends up in construction and demolition landfills or is burned in waste incinerators or biomass power plants.